If you enjoyed eating at the current Smokee Mo's in 2018, you are gonna LOVE our new barbecue restaurant in West St. Louis County. Smokee Mo's St. Louis BBQ will be opening in May 2019 in West County off Manchester Road, just a block West of Hwy 141. As you can see from the construction photos below, it's going to be a Barbeque Barn unlike any of the other restaurant in the metro area. We are making it our business to put this new restaurant in the top 10 places for barbeque in St. Louis by 2020. Like us on Facebook to stay up-to-date on construction photos and any contests we will be running for the new restaurant. You don't want to miss it! Follow us here on Facebook. Check out our latest construction update video below. Looking for the original Smokee Mo's website? Just click here for the Best Barbecue in Jefferson County. Check out our 2018 Welcome Video below and see why everybody is talking about Smokee Mo's. We offer the best of traditional and vegan barbecue and Whole Hog Catering out of all barbeque restaurants whether in the City, North, South or West County. We are the best St. Louis area BBQ restaurant, ranked in 2017 and 2018 among the 10 best in the metro area serving traditional barbecue and more....and we are coming soon to West County! You've Had The Rest - Now Try The Best! On our regular menu you will be able to choose traditional barbecue like your pappy used to make, such as delicious Baby Back Ribs, Sweet Pulled Pork, Golden Turkey, the Best Beef Brisket, Savory Italian Sausage, a juicy Steak Burgers, and Tender, Juicy Chicken, as well as some vegan BBQ and vegetarian items exclusive to this new location in West County. We do our meats low and slow, over real select oak hardwood. At our restaurant we serve top rated traditional smoked meats plus some special items each day. Unlike many of the best BBQ Shacks around town, we offer not only the best traditional meats, but we also offer a variety of specials that rotate every day. Check out this slideshow to see what's coming soon to West County in 2019. Click on any photo below to see a full size, larger photo if available. Other places in the metro area advertise the best BBQ experience, but at our restaurant we actually deliver the best! We cook our meats and make our sides fresh every day. Some of our meats sit in the smoker for 14 hours. Most sides are made fresh, from scratch, in house as needed. See our MENU page for all the different hot and cold sides we offer to go along with the best Q. You can forget about generic desserts served at other barbeque restaurants. 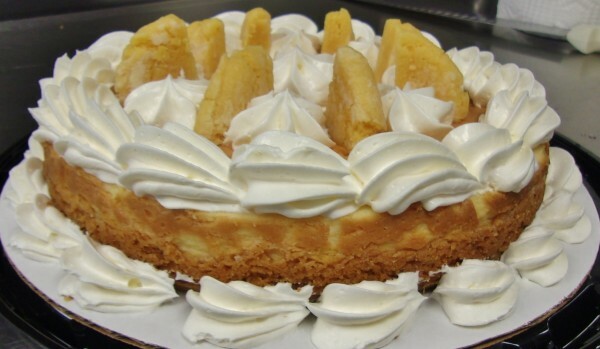 We serve only the best, fresh desserts from the best bakery in Kimmswick Missouri. 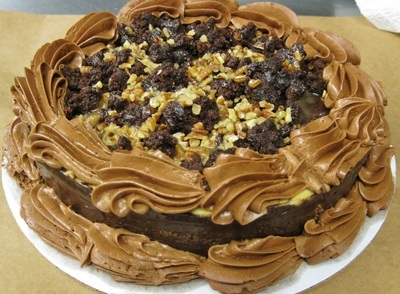 The legendary Blue Owl Bakery bakes up fresh Apple Crisp, Carrot Cake, Chocolate Passion Cake, Gooey Butter Cake, Chocolate Caramel Brownie Cheesecake, and more. Our chocolate chip and M&M cookies are made in-house. If frozen custard is your thing we make our own right here in our kitchen. Vanilla, Chocolate and our customer favorite.... Smokey Maple Bacon are available to eat here, or to go anytime. There's nothing like some cool frozen custard after eating our hot barbecue. What's more fun than an old fashioned pig roast! Who doesn't like a good pig roast with a whole hog cooked to succulent perfection? 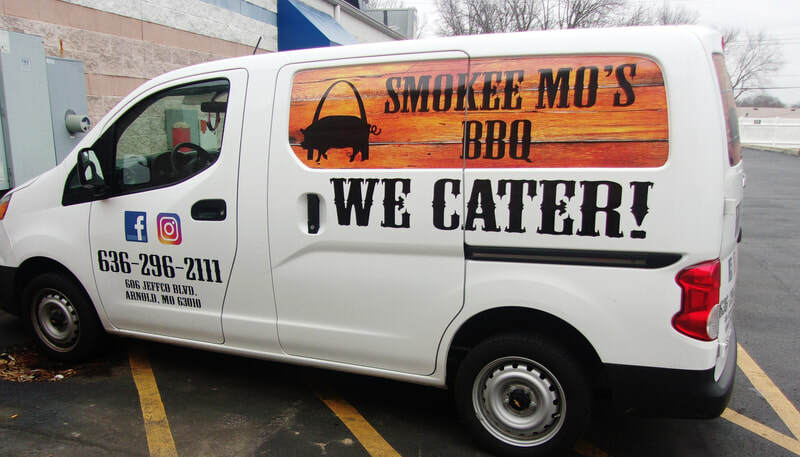 Smokee Mo's Whole Hog Catering is provided by one of the few barbeque restaurants in St. Louis that has the experience and the equipment to handle the perfect smoking of a whole hog for your pig roast, for up to 200+ people. 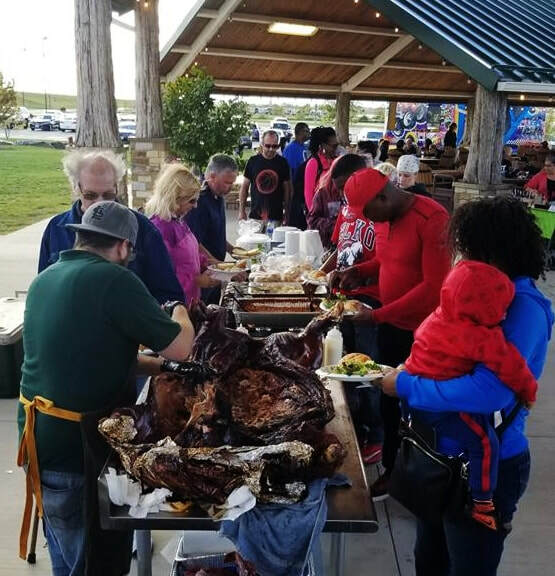 Be the hero and give your guests the best unique barbecue experience at your catered event in 2019. Say PIG ROAST and watch smiles appear on everyone. We also offer our regular catering services for your special events. See the link above to our Catering Page for details and our catering menu. We can cater your next special event any time. Remember us at Thanksgiving and Christmas this year, and give your guests a real treat. We can provide the best Whole Turkey, Boneless Turkey Breast, or Beef Brisket and all the trimmings you need to have a relaxing Thanksgiving or Christmas BBQ dinner. Our whole turkeys are available in both a medium and large size for any size holiday party. Our top rated Boneless Turkey Breasts and Beef Brisket are available by the pound. Relax this Thanksgiving or Christmas and let us do the work for you. See all the details for a turkey or beef brisket dinner on our Holiday Menu Page. Available in November and December. You will no longer have to drive long distances to Pappy’s, Sugarfire, Bogart’s, or Adams Smokehouse for your BBQ fix. You will find Smokee Mo’s St. Louis BBQ, one of Google's Top 5 rated metro smokehouses, centrally located in the West County area in the Spring of 2019. The Gateway City area has plenty of good clone type Q shacks like Sugarfire, Pappy’s, Bogart’s, Adams, and Dallies, but if you want something exceptional and innovative then make the switch and try something new this Spring. We will have more than a half dozen totally new vegan and vegetarian menu items not found at other BBQ restaurants, and we will be just a short drive from anywhere in North, West, or South County. If you enjoyed your dining at Smokee Mo's in 2018 or had the best Whole Hog Catering experience, please write a nice review for us here. Click on the Facebook link to LIKE and FOLLOW us for the latest menu updates, specials, contests, and news.